Local mail postcards is a campaign type to send postcards to potential customers in specific geographical areas. Unlike targeted postcards, no mailing list data is needed. You simply select the zip codes or specific postal delivery routes you'd like to target. The postcards are mailed and delivered within 6-8 business days. We only offer this campaign type in our huge 11" x 6" postcard size. They'll stand out in any mailbox! 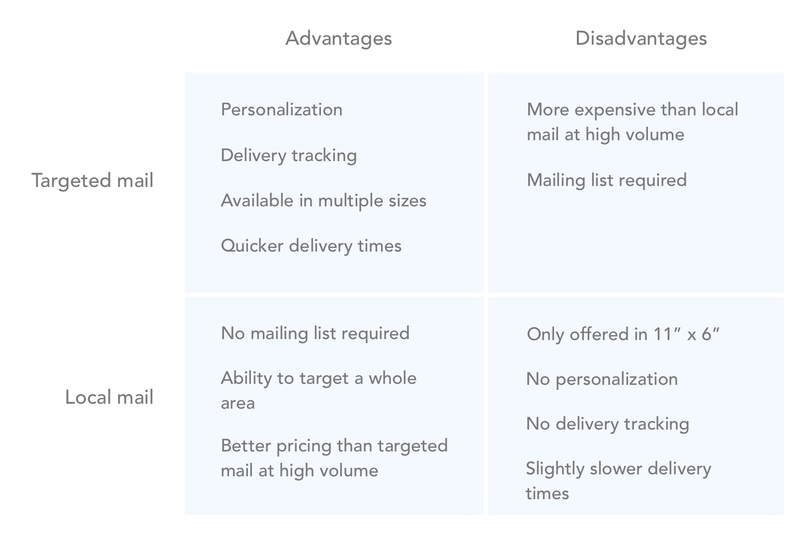 Volume pricing is significantly better than targeted mail at scale. 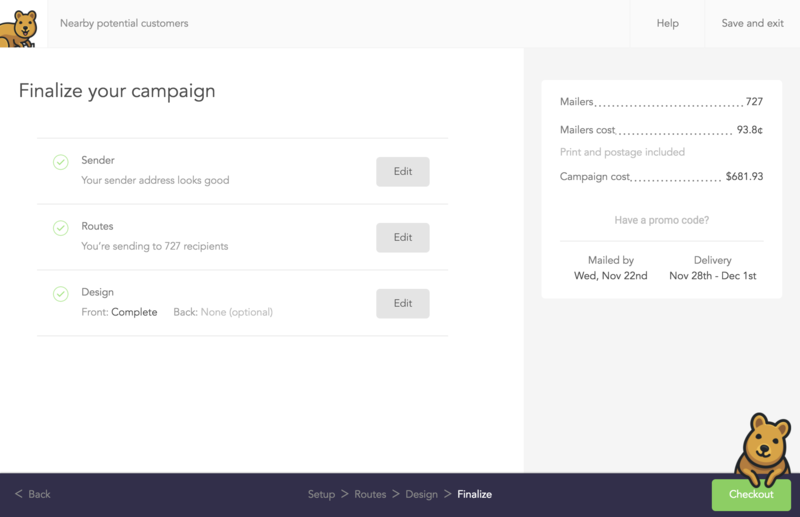 Local Mail is an additional campaign type that you have to enable in order to use. You can enable it in your Account profile. 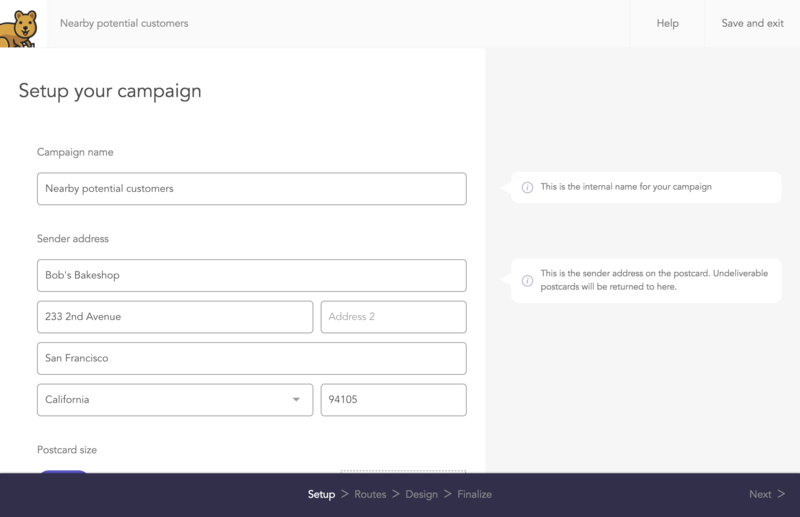 Once enabled, you'll be able to choose Targeted or Local campaigns when you go to create a new campaign. Local mail postcards are the perfect option for reaching out to people in a very specific local area. No mailing list data is required and you have full control over which zip codes and postal routes to target. Targeted postcards are the perfect option for reaching out to people where you have their data, and ideally, a prior relationship. 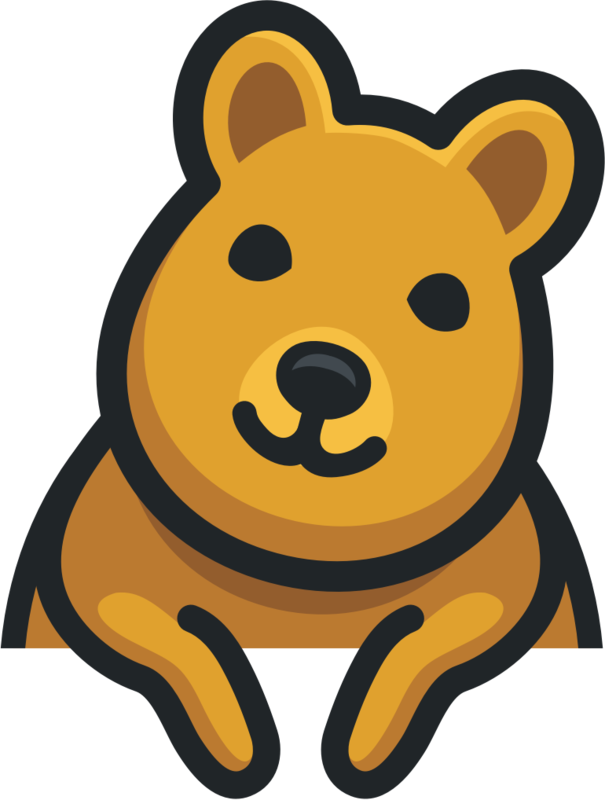 They're often used to communicate with customers or very targeted prospects. Postcard credits can not be applied to Local mail campaigns. These are your campaign basics. Be sure to include your return address in case any of the postcards are returned to sender. This is your mailing list. You only need to provide a zip code. From there, we show all available postal delivery routes in that zip code for you to choose from. 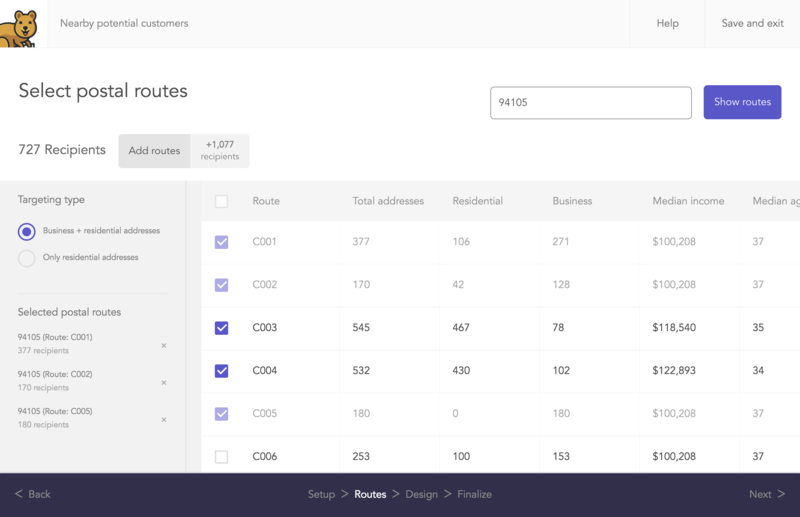 You can either select every route in the zip code or just the ones that interest you. If available, each route includes data like average household income and a breakdown of age ranges. All data is provided from the 2010 US census. The design is what the front and back of your postcard will look like. 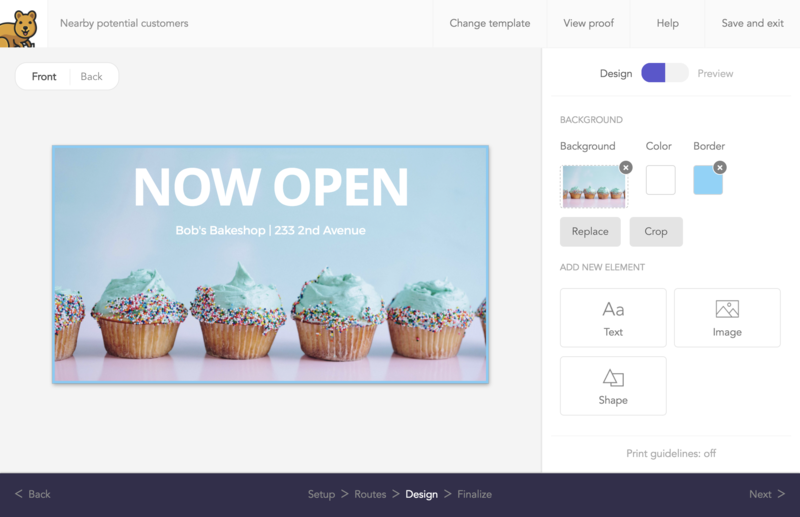 Use our simple drag and drop postcard designer to customize one of our many free postcard templates. You can also upload your own graphic design. The postcard's back design is slightly different than the back design for our targeted 11" x 6" in that the postage block is smaller and located in the top right. 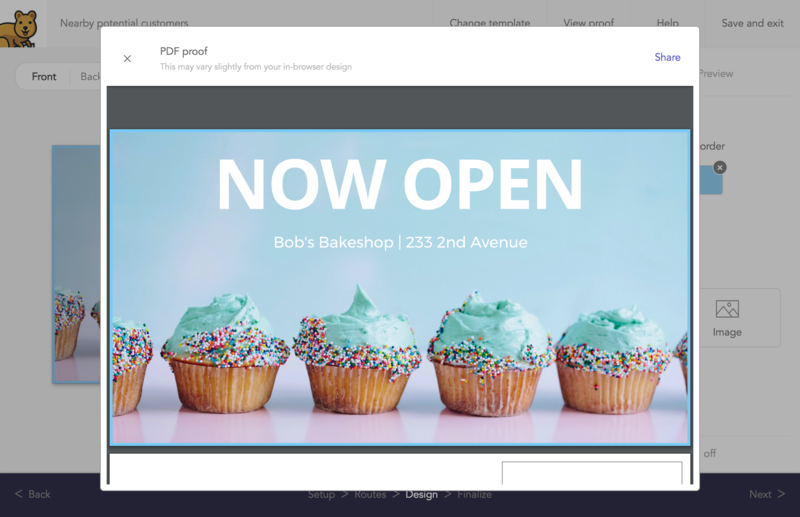 When you're ready to order a campaign, be sure to view a PDF proof to ensure everything looks good. You can even share this proof with others. Simply provide their email and we'll automatically send them a link to your design. The finalize page offers a checklist to make sure everything in your campaign is good to go. This is where you'll also see the cost of the campaign. Unlike targeted postcard campaigns, local mail campaigns are not trackable. You can however always see an overview of the campaign through the campaign results page.